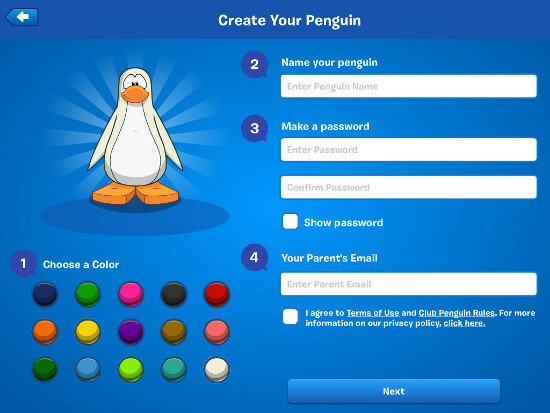 When the game wizards who created Club Penguin sat down to create the basic game design they had a specific set of goals in mind, because the game that they were making was intended to serve a very select target audience: their younger, tween, and preteen kids. 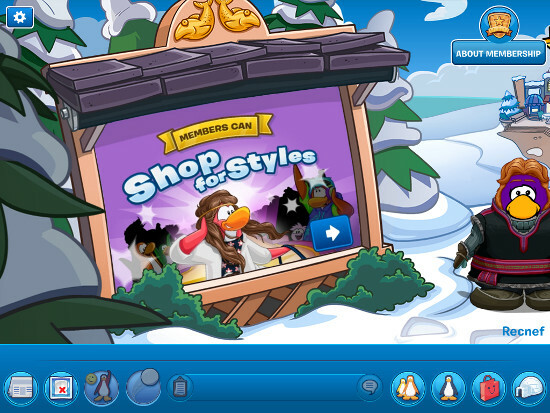 That's not an exaggeration - Club Penguin was initially envisioned as a social-based MMO for younger gamers precisely because there was a paucity of games in that genre, and there was a significant demand from younger gamers, who wanted an MMO-based fantasy world of their own that was at least as interesting and fun as those enjoyed by their older sibs. It probably did not hurt matters that the team that created it happened to be parents of members of that target audience, or the fact that there was a general sense of urgency towards getting the project into a beta form thanks to other competitor games that were announced after they began work on the project. What followed was not so much luck as it was destiny. Sure it is lucky that Disney was the company that ended up supporting the project, since it was a games company that not only willingly pitched in to support Club Penguin but also helped nurture it when it ended up being way more popular than anyone expected it to be. 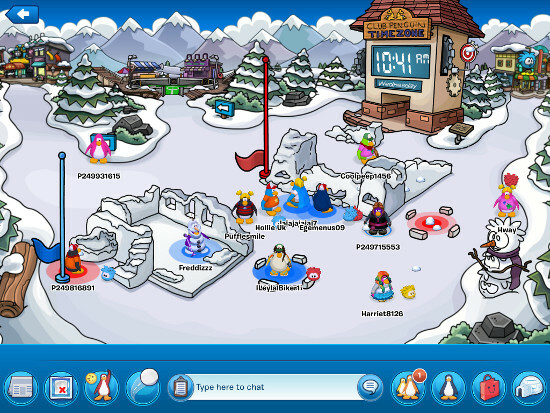 The point is that back in 2005 when the original Club Penguin for the PC was created, it was intended to offer a fun, safe, and social fantasy world for younger gamers that would continue to grow and expand along with its audience, which in the first couple of years grew to over 30 million gamers worldwide. By the time the Mobile Edition of the game arrived on iOS in 2013 the global player base was in excess of something like 200-million-users worldwide! That, largely due to the combination of word-of-mouth, and the fact that it offered a solid social game play experience. In a nutshell what Club Penguin is, when you peel away the social layer and the ego-pleasing elements that include creating your own Penguin avatar, decorating their igloo home, and adopting some darn cute pets, is a fantasy world full of neighborhoods, each of which has its own set of mini-games that literally span the popular genres! We'll get back to that in a moment. First lets talk about the member-based side of things. 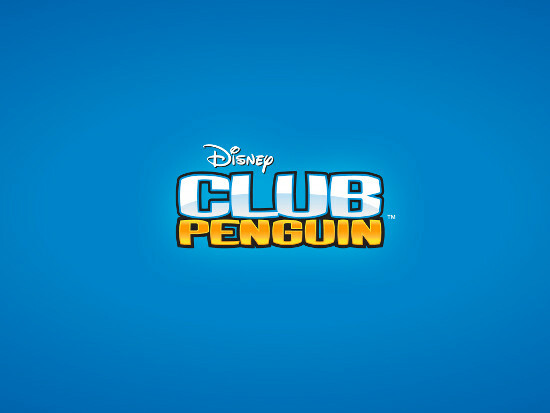 Club Penguin is technically a Freemium MMO for younger gamers. What that translates to is pretty simple really - on the free side players get a basic Penguin avatar that can be lightly customized, a home in its fantasy world that has limited decoration capacity, and access to nearly the entire range of the different mini-games and most of the special events. Free accounts get access to the social side via playing games and chatting with friends - both the sort you bring into the game with you and those that you meet after you start playing. In fact save for a specific set of restrictions, game play on the free side of CP is pretty comprehensive and certainly worthwhile if you choose not to opt in to a paid membership. 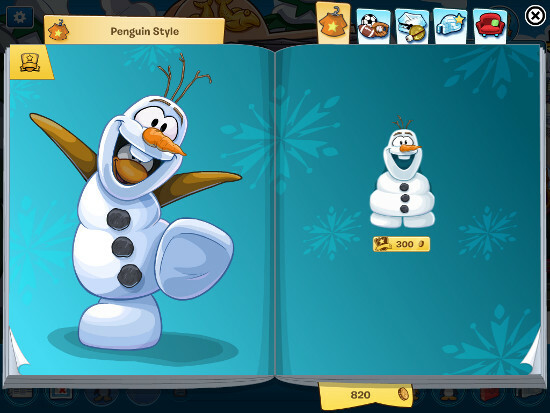 There are no direct advertisements - though there are some subtle ones in the form of sponsored content from other Disney IPs that feature as part of the CP world. 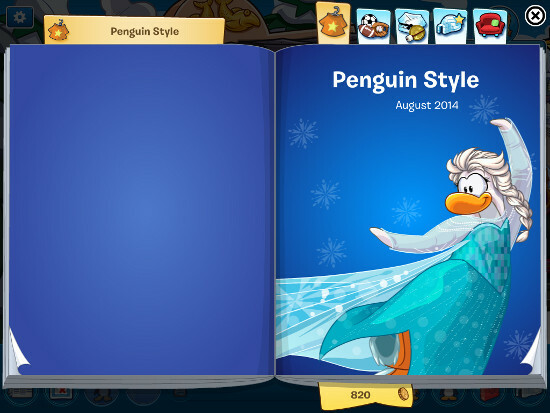 For example the Frozen movie and in an indirect way the Frozen video game are a good and current example. 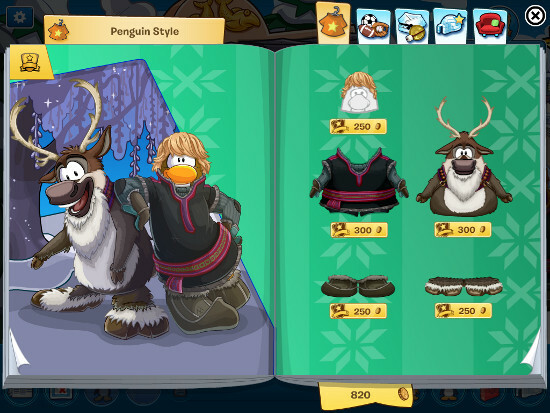 But as that presence tends to take the form of costumes and clothes as well as furnishing and props you can “buy” for your Penguin avatar and their home, we would be hard-pressed to label that advertisement. * Transform into the characters of Olaf and Marshmallow (From 21 Aug. thru 3 Sept.). It is not so much that a free-player can't find other things that they can do as it is a lot of the above being very cool and, more to the point, desirable activities - which after all is sort of the point. It is easy enough to start out a free-player, but thanks to the above activities the draw towards becoming a paid member is strong. The cost of paid membership is down to a monthly subscription fee - the longer you pre-pay that in advance the less expensive it is. Subscriptions are available in 1-month, 3-month, 6-month, and 1-year increments. Membership subscription fees can be paid for in a variety of ways, from using a credit/debit card or PayPal on the game's home page, to purchasing Gift Certificates or Pre-paid Subscription Cards at a large variety of retail outlets. Parents can also pay - via the RewardsPay Program - with freqent flier miles or credit card bonus points from Discover Card, VOILA, SAS EuroBonus, and Choice Privileges. The cost works out - in US dollars - to $8 for 1-month, $20 for 3-months, $40 for 6-months, and $60 for a year, so you can see the savings advantages of paying for longer subscriptions. In terms of game longevity Club Penguin already has a lot going for it. The main game has been around since 2005 and has a dedicated team of wizards whose job it is to continue to add interesting and fun content, special events, and collectible items and objects, and the lunch of the Mobile Edition of the game in 2013 assures that an even wider variety of new events and activities are in the pipeline. One thing that is worth noting is that Club Penguin differs significantly from most commercial MMOs in meaningful ways... First there is the matter of its origins. Then there is the issue of its approach in terms of being what can only be described as a purely optional Freemium game. The objectives were crystal clear: create a game for Tween and Preteen gamers that is both safe, well-structured, and perhaps most important of all, includes the many different elements of the MMO and social games platform that were strongly desired by its target audience. They understood that the segment of the gamer market they were servicing was good and darn tired of their older sibs getting all the good games and they getting none! With that in mind those do-gooder game wizards set out to create a safe and secure MMO for that target audience and along the way included all of the social elements they felt were strongly desired, while at the same time offering a game play experience that includes certain educational and development offerings that the player base is completely unaware of. Club Penguin - in addition to including a full selection of social networking mini-games, interactions, and “friend” experiences - also has built into it a selection of activities and games that improve motor skills, hand-eye-coordination, memory, creativity, teamwork skills, and offers lessons on a very wide variety of subjects including money management, economics, and a goals-oriented approach to game-based accomplishment-gratification. 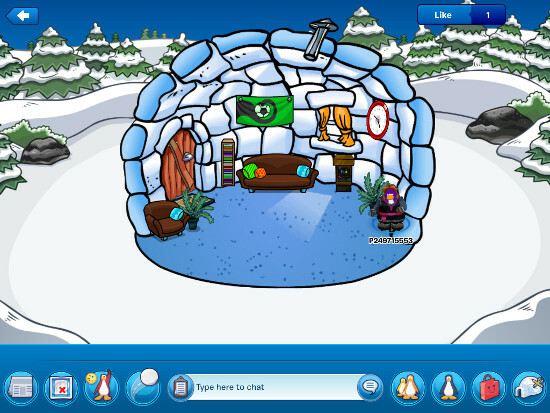 Game play in Club Penguin was created along the WYSIWYG line with three basic goals in mind: Community & Friendships, Creativity & Imagination, and Exploration & Discovery - all of which are intended to be obtained at a reasonable cost for paid membership. The graphics in CP are a rather odd matter because while it is clear that no attempt was made on the part of the programmers to shoot for anything cutting-edge or groundbreaking in terms of world view or special effects, the very clearly animation-oriented cartoon-like presentation that they ended up with is, nevertheless, remarkable in its own right. 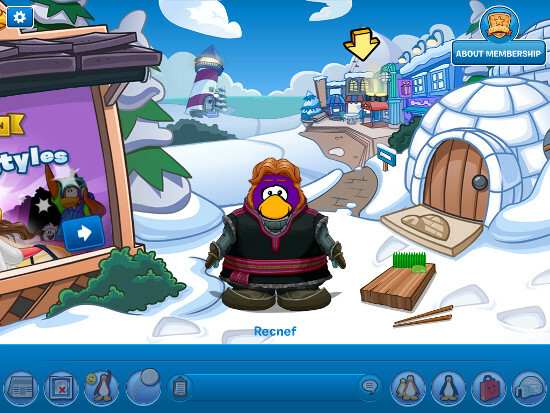 Leveraging the SmartFoxServer engine, the game uses cartoon-penguin-avatars to represent the player, who finds themselves in a virtual world set in a perpetual winter wonderland in which, naturally enough, your typical game-playing penguin would find themselves. The eye-pleasing color palate is accelerated by a massive amount of content that, to the typical adult gamer might seem to be very jumbled and difficult to track - but to the typical younger gamer hits just the right note in terms of frenetic energy and the constant quest for something new to do! 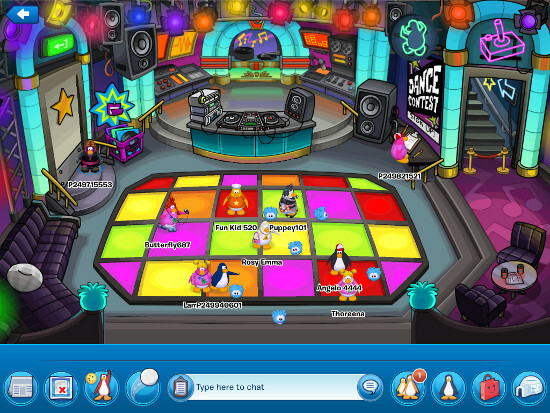 Music and sound in the world of Club Penguin was clearly a well-planned and substantial element in the game - not just because music is used to set the pace and mood, but also because sound effects were used as a means of establishing environment variables. Ambient and background sounds include bird song, the wind, and water that is used to great effect even though it is downplayed to a point that unless the player is specifically listening for it, it normally retreats to become part of the overall game experience. Music is used for transitions between zones and the start of activities, and each of the major activities has its own unique sound and music that both reflects mood and offers audible hints to the player when things are going to get more interesting. Environment sound effects - for instance the sounds that the sushi makes while floating down into the depths before it is swallowed up by a clam at the bottom of the ocean are comically-prompted and predictable while at the same time giving the process a nice feel emotionally - which was the entire point. Money in the game takes the form of gold coins - and those gold coins rather than being purchased by exchanging real-world funds, are earned by completing a wide variety of tasks and mini-games inside CP so that it never takes on the feel of being a freemium game even though that is what it is. That point is worthy of emphasis - Disney is happy with the subscription fees it earns to the point that, bucking the established trend in this sort of MMO or even the freemium market itself, does not feel the need to further monetize the process. That is an important aspect to their approach because it directly impacts the literal value for money considerations for the game! And taking into account that value-for-money issue, the massive amount of content, the very high ratio of action-to-reward, and the game's ability to keep younger gamers fully engaged and entertained are such that the value side of the equation is clearly disproportionately in favor of the player, and not the game maker. 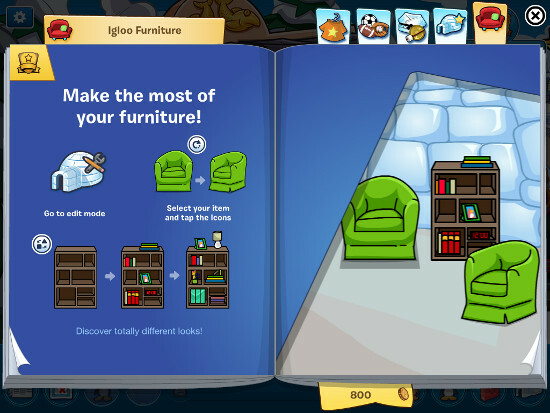 From the very start of a play session the player begins by playing the Sushi mini-game and earning gold coins, then pays a visit to their Penguin's home - or the member store if they are a member - where they might add a new object or piece of furniture to their collection to be placed in their home. Deciding where to go and what to do takes several forms. The easiest method is to tap on the beckoning arrow that sits above the main screen which will take you to the closest zone and, as you wander about it, a number of mini-games and activities - as well as opportunities for making new mates and finding conversations present themselves. 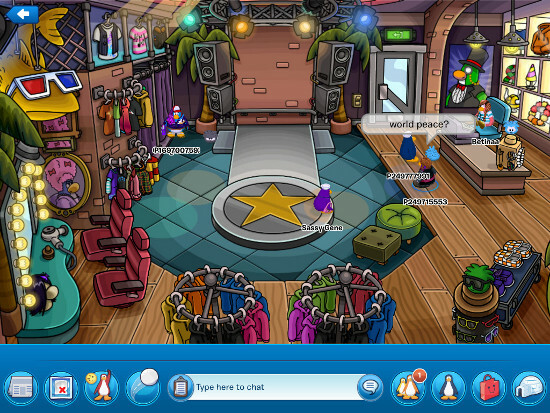 That first zone includes a Coffee Shop, Dance Club, and Clothes Shop - call that an introduction to the world of Club Penguin - inside of which can be found a number of mini-games. In the Coffee Shop the new player can catch sacks of coffee as they unload a truck, or make play a bouncing Smoothie-Smash game using their bum to smash fruit - having fun and earning gold coins in the bargain. A simple tap on the Penguin avatar of anyone else who happens to be in the zone will show you their “Card” and can easily lead to making a new mate! Value for money? Oh it is there in piles, because the game succeeds in doing something most parents cannot manage in every day life - it provides a massive amount of variety and something new to do pretty much at the asking! Shadowmatic is an imagination-stirring puzzle .. Racing Penguin (or Flying Penguin) is a .. Welcome to Camp Pokémon! Discover the ..
A new mobile-optimized FarmVille experience ..